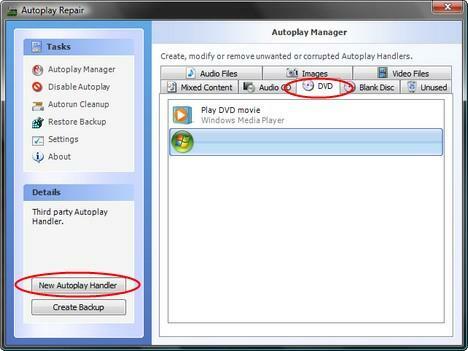 First, you need to download and install Autoplay Repair. This can be done from the OrangeBlue site. Alternatively you can download it from our site, using the download link posted at the end of this article. 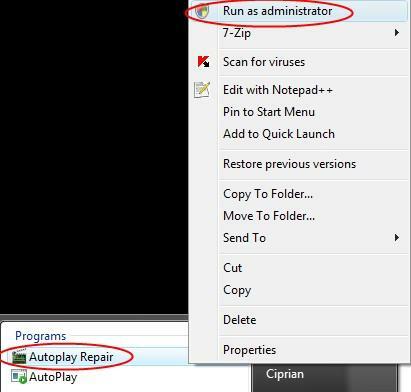 Once installed, you must run Autoplay Repair as administrator. To do this, right click on its shortcut and select 'Run as administrator'. When working with Autoplay Repair, don't use the Autorun Cleanup. 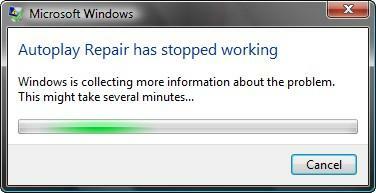 For some reason this feature is not compatible with Windows Vista and it will cause the application to crash. 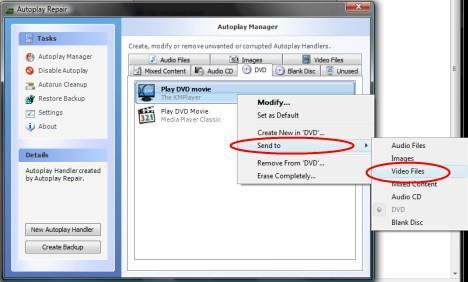 To add custom entries to Windows Vista's AutoPlay click on Autoplay Manager. There you will see lots of tabs, each containing the autoplay settings for different types of media. To add a new entry, click on the appropriate tab and then on the 'New Autoplay Handler' button highlighted in the screenshot below. 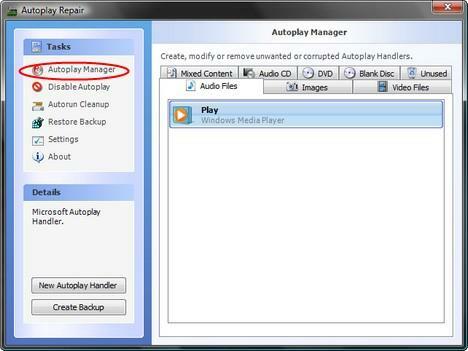 NOTE: I noticed that Autoplay Manager doesn't read correctly all the default AutoPlay settings from Windows Vista. 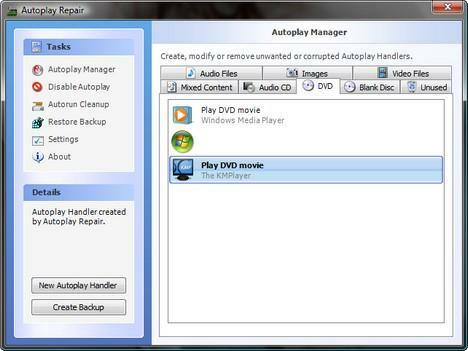 However, all entries added by Autoplay Manager will show up in Windows Vista's AutoPlay panel. Next, type the name of the action that will be done and its provider. The provider should be the name of the application doing the action. To explain better, I used KMPlayer as an example. KMPlayer is a good video player which doesn't get registered in Windows Vista's AutoPlay settings. I needed to add KMPlayer as one of my DVD movie players. Therefore, the name of the action is 'Play DVD movie' and the provider is KMPlayer. After this, click on the button with three dots, browse and select the main executable file of the application. Autoplay Manager will also set the icon shown in the AutoPlay menu as the default icon of the selected application. You can change it by clicking on the Icon button. Browse and select the file containing the desired icon. 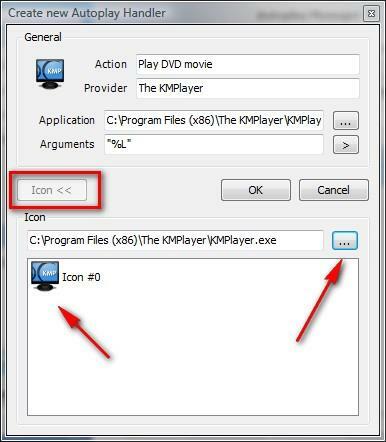 You will see all icons found in the selected file. Click on the one you want to use and then on OK. The new AutoPlay item is now added. If you need to edit any of the available AutoPlay items, you can right click and select Modify. One option which I found very useful is to copy one AutoPlay entry from one tab to another. To do this, right click on the entry you want to copy, then on Send to and select the tab where you want to copy it. Once you have added the entries that you need, you can test to see if your configuration works. 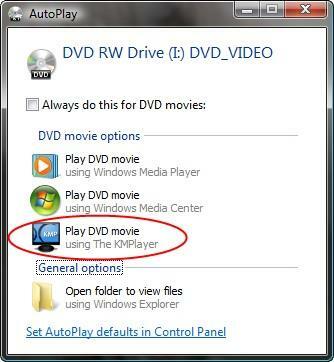 As you can see from the screenshot below, when I insert a DVD movie, KMPlayer is now shown in the AutoPlay menu. NOTE: After adding several applications to the AutoPlay menu, I noticed that some applications did not function properly. 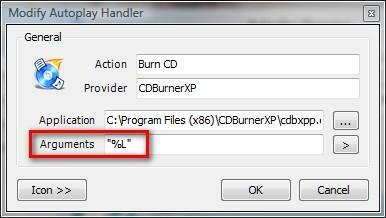 For example, CDBurner XP crashed each time I entered a blank CD and selected from the AutoPlay menu the option to burn it using CDBurner XP. After investigating for a while, I realized that this happened due to the fact that Autoplay Manager automatically adds the parameter "%L" to each application you add. If you have similar problems with any of your applications, then delete this argument and try again. Chances are, the application will work without any problems. Thanks, the part about removing the parameter "%L" was particularly helpful, since I found that the autoplay programs would not work with this attached. Also, Vista users should run the program as an administrator, as the writing to the registry required may not work otherwise. I'm currently using Lifehacker's DVD Rip in conjunction with DVD Shrink and when putting DVD Rip into the Autoplay for DVD, it moves the last "e" of the program's ".exe" extension into the Arguments section and every time acts as if I had not run the script before (the intro script only runs on the first execution). Any thoughts? Thank you so much! I've been searching for a program like this!